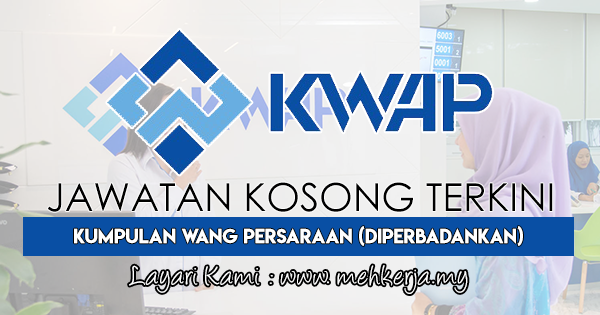 Kumpulan Wang Persaraan (Diperbadankan) [KWAP] or Retirement Fund (Incorporated) is a Pension Fund Institution established on 1 March 2007. Our main business functions are to manage contributions from the Federal Government, Statutory Bodies, Local Authorities as well as administration, management and investment of the fund in equity, fixed income securities, money market instruments and other forms of investment as permitted under the Malaysian Retirement Fund Act (Act 662). In May 2008, KWAP underwent a review and enhancement of its existing business model and capabilities to enable it to fulfill its vision of becoming a high performing fund assuring sustainable pension benefits. 0 Response to "Jawatan Kosong Terkini di Kumpulan Wang Persaraan (Diperbadankan) [KWAP] - 13 April 2018"